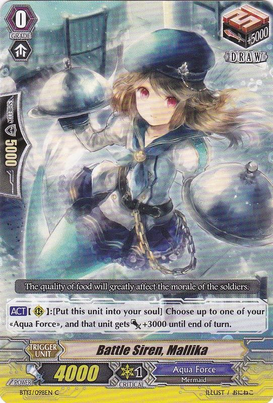 Le-Vanguard: Aqua Force Deck Profile, opinion and Guide. Aqua Force Deck Profile, opinion and Guide. Hey folks, Its been a really long time since i ever update this blog and write a detailed article about vanguard. 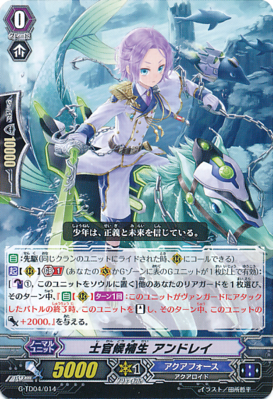 Today i'll be sharing with you my opinions and thoughts of piloting aqua force and the new support that it has received in this booster. Here is the deck list that i've been using and testing with. Tested with DOTX, SSSD, etc... etc.. The matches I had using this deck lasted not more than 6 to 8 turns. Somewhat of a blitzkrieg which suited my aggressive playing style which puts loads of early game pressure. The main strategy of this deck revolves around the consistent early game pressure to deal as much damage and drain as many 5k shields from your opponent as possible to setup for your Savas to finish your opponent. Now you've know the list, Let me also explain why I played and teched in certain cards and also explain some of the combo involved. Savas is the MVP(Most Valuable Player) of the deck or what i would called the FINAL PUNISHER or your main winning image of the deck. In short he is there to wreck your opponent. 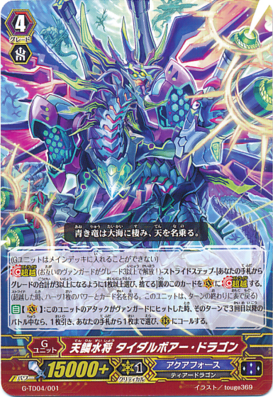 His had a GB2 skill similar to the notorious card from the Kagero Clan, Transcendence Dragon, Dragonic Novelle Vague. Those who had encountered him would know the horror of not being able to guard with grade Zero. Savas however has an added pressure of having the extra critical to pressure your opponent. However all these effects takes place only when you had fulfill its conditions of having 4th battle and GB2. Many would be questioning, how do I get my GB2 by turn 5? My answer would be using Snow Element Blizza. His second effect is optimal for crippling your opponent's field however it has a random retiring effect where your opponent chooses 1 of his rearguards to retire despite having to pick 3 cards. Paying the cost of counter blast 1, Flipping 1 G-Unit Faced up enables you to fulfill the condition for Savas which needs GB2 in order to activates its effect. Blizza would be the 1st card you would want to stride on if you wanted to use savas as a finisher for the next turn. Which it swings for 31k without boost on its own which is enough to bait out the negates and sentinels from your opponent's hand or to quickly push them to 5 damage in order to pressure them with your relentless attacks from your rearguards for the next turn which would be probably your opponent's final turn. So in short what I am trying to say is that Savas + Blizza = GB2 condition fulfilled. Stride (Released when both players' vanguards are grade 3 or greater! )-Stride Step-[Choose one or more cards with the sum of their grades being 3 or greater from your hand, and discard them] Stride this card on your (VC) from face down. 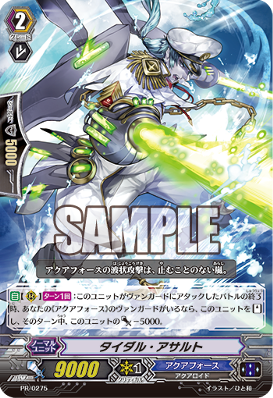 [AUTO](VC):[Choose a card name "Marine General of the Sky and Earth, Lambros" from your G zone, and turn it face up] When this unit attacks a vanguard, if it is the fourth battle of that turn or more, you may pay the cost. If you do, choose up to two of your rear-guards, and [Stand] them. Then, if the number of face up cards in your G zone is two or more, the units [Stand] with this effect get [Power]+10000 until end of turn. Lambros is whom we revere as the final finisher of the deck. His effect is what i called epic. With the meagre cost of Turning a copy of itself from the Generation zone face up, you are able to stand 2 of your rearguards and give a +10000 power is what I called an epic finish and overkill. Nuff said. How is lambros used in this deck? usually it would be the best alternative besides blizza to achieve the GB2 condition for savas and also to grant an additional 2 rearguards attack for the early game pressure to quickly wipeoff their shields and options to retaliate to your assault. 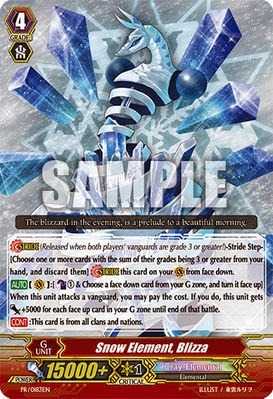 (This card cannot be in your main deck)Stride (Released when both players' vanguards are grade 3 or greater! )-Stride Step-[Choose one or more cards with the sum of their grades being 3 or greater from your hand, and discard them] Stride this card on your (VC) from face down. (When this cards Strides, it gains the power and name from one heart. At the end of the turn, return it face up. 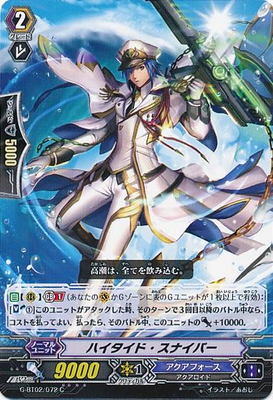 )[AUTO](VC):When this unit's attack hits a vanguard, if it is the third battle of that turn or more, draw a card, choose up to one card from your hand, and call it to (RC). Tidal bore is good for early game pressure and gaining handsome advantage which allows you to draw a card and being able to call it from the hand. Tidal bore is hardly used in this deck as you would not need to farm much for the handsize as the objective is to finish your opponent quick, blitzkrieg style. Next I will be explaining to you how the other cards in the deck synergizes with the strategy and also tips on how to use them. [CONT](RC) Generation Break 1 (This ability is active if you have one or more face up G units in total on your (VC) or G zone):During your turn, this unit gets "[CONT](RC):This unit may attack from the back row." and "[AUTO](RC):When this unit attacks, if this unit is in your back row, this unit gets [Power]+3000 until end of that battle.". Sutashia has the special ability to be able to attack from the back row which makes her invulnerable as an attack target. Having this ability, she allows you to have another rearguard in the same column to lay another attack on the opponent which gives the whole column the ability to deal at least 2 attacks. 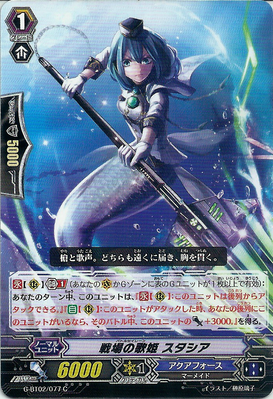 She is tactically used to knock out your opponent's rearguard interceptors which is very useful especially when using aqua force, it is integral to have your opponent to guard from their hand and to drain their resources. Thus, giving them less options & resources for the next turn and having lesser cards to call as rearguards. Magnum assault would be the card that will give your vanguard the wings to victory. He is the card that you would want to call from turn 3 onwards or when you have access to Generation Break 1. You would usually want to call this card out to replace your Tidal assaults (which i would mention more about it later) where it usually be the No.1 attack target your opponent would want to eliminate after being devastated by it on turn 1 to turn 3. Magnum assault has the special skill of being able to stand itself after being boosted to attack the vanguard and +2000 power make it an effective 15k guard column. This makes him annoying for the opponent in the long run to have him consistent deal damage to the opponent with perfect numbers of 16000 and 11000. Magnum assault having a an awesome ability has a downside to it where it is a vanilla card on between turn 1 to turn 3 or any turn where you have yet to reached generation blast 1. 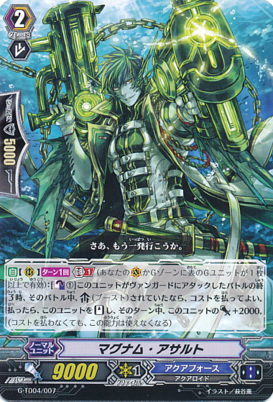 Which makes tidal assault the best card to replace his rearguard position during the turns of the early game. Tidal assault is the unit you would want to call on the early turns of the game where he would be most effective in dealing damage to vanguards who have a base power of less than or equal to 9000. Tidal assault is an effective restanding rearguard when it comes to early game pressure where your opponent's vanguard power is within its reach. Ideally, you would want to place a booster behind it who has a power of at least 5000 in order to make up for the cost of -5000 for its effect to pull off. Tidal assault may seems OP to some during the early game. I bet some of you would have questions on How do I exactly counter this card? My answer would be playing a 10k vanilla grade 2 to prevent getting wrecked by this card during the early game. 10k vanilla would be the best option as a mini counter as aqua force in general would have a hard time attacking with their rearguards in the early game which are usually 9k and would have prevented you from losing additional hand cards and being devastated to 5 damage in the long run. Here is a tip that may be useful when using tidal assault in the turns of the Midgame to Lategame which is to combine with Battle siren, Mallika for it to be able to reach the 11k base power vanguard. Mallika had proved to be one of the most important trigger unit in this deck and that you should have at least 4 copies of her in the deck. She would be the most important card that you would want to play between turn 3 to turn 4 and would be ideal for a situation where you do not met the Generation Blast Condition for your magnum assault. Hence, ideally you would want to have the tidal assault remained on the field for pressure during the midgame combo with this card to continue swinging for perfect numbers. 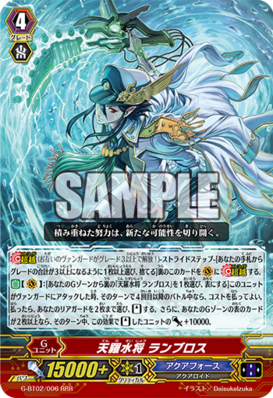 Mallika also combos well with Battle Siren Sutashia, allowing her to attack for 12000 power, hence able to deal pressure and damage to the opponent's vanguard as well. [AUTO](RC) Generation Break 1 (This ability is active if you have one or more face up G units in total on your (VC) or G zone):[Soul Blast (1)] When this unit attacks, if it is the third battle of that turn or more, you may pay the cost. If you do, this unit gets [Power]+10000 until end of that battle. High tide sniper is one of the best cards to have swinging for 3 or more battle where itself as a standalone is able to drain a 10k shield from the opponent. Having it with a booster would make him a devastating 20k guard column. High tide sniper also combos well with the starter vanguard, Officer Cadet, Andrei (Who i will mention more about him later.) 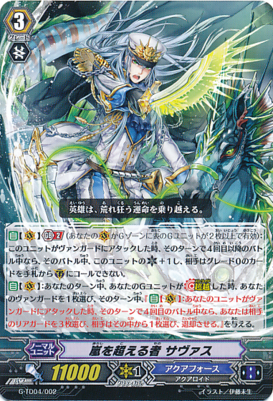 and also Battle Siren, Orthia. He is such a key card during the mid game to late game onwards where he is needed to use for the final finishers and big plays involving Lambrose. [AUTO]:Forerunner (When a unit of the same clan rides this unit, you may call this unit to (RC))[ACT](RC) Generation Break 1 (This ability is active if you have one or more face up G units in total on your (VC) or G zone):[Counter Blast (1) & Put this unit to your soul] Choose another of your rear-guards, and until end of turn, it gets "[AUTO](RC)[1/Turn]:At the end of the battle that this unit attacked a vanguard, [Stand] this unit, and this unit gets [Power]+2000 until end of turn.". His ability allows your rearguard to be a Magnum Assault which is often used as a desperate measure to have a rearguard able to hit for the 4th attack or combos with High tide sniper to attack for a 21k column perfect numbers on its own after a boosted attack. Andrei + High Tide Sniper = 10 shield + 15k shield(3 cards). Andrei + 11k attacker = 5k shield + 5k shield(2 cards). 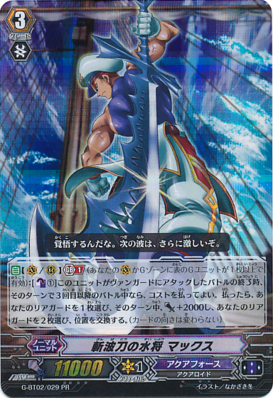 Slash max is an awesome backup vanguard where he allows rearguards to switch positions and giving a +2000 power to one of your rearguards when he is the 3rd to attack. He is especially useful when you have a hand full of attackers which also help fix jam and dead columns. He also give 9k attackers a +2000 power boost, hence enabling them to hit for perfect number of 11000 and drain additional 5000 shield from the opponent. He would be the best option as a backup vanguard if you can't stride. To conclude, Aqua Force is not the clan that you want to mess with during the early game and proven to be annoying to the opponent to consistently guard 5k shield. It has a similar aggressive play style to spike brothers. So how do i exactly counter this clan? There are many options, in this case would be playing kagero, since it is in the current metagame, where they have cards such as Prowling Dragon Striken where you can prevent the early assaults from tidal assault and 9k rearguards, making you invulnerable to their early game rush strategy which forced them to stall till late game. Another counter measure may be using anti-rush cards such as the good old Berserk Dragon where you can instantly retire their biggest threats in the early game, during turns 1 to turn 3. To my Kagero players, there is still hope and counter measure against this clan.